I work in communications and project management in the NHS, which involves working with hospitals and patients across north London to provide the best possible quality of service and improve ways of doing things for patients. I really enjoy working with both patients and clinicians, and really admire everyone who works in the health sector. What's your proudest career moment so far? My first job was working as a regional newspaper reporter, and it was a great feeling to have my first article printed knowing that thousands of people would be reading it that afternoon. I still have a copy somewhere in my flat! What's your favourite way to relax and unwind after a busy day? I've a six month old son, Luke, so we relax together by reading 'Goodnight Moon' and 'Dear Zoo' and listening to music. And then after he's asleep, I've been watching the second series of Master of None on Netflix which is fantastic. I wanted to be a journalist ever since I was small, and followed that path for several years after university. I still really enjoy writing and I'm so lucky to be able to be working on spreading the word about our music festival. What are your favourite pastimes outside of work? I play the violin in an orchestra, and we've played shows with some great artists including Darren Hayman, Haiku Salut and Ralegh Long, as well as releasing our own album. I also really enjoy helping to organise the Indietracks festival, and when I'm not doing those things I really like reading, films and catching up with friends. Before I started maternity leave, I worked Monday to Friday, so my weekend would start on Friday evening and run until Sunday night. My husband Andy follows the same pattern, which is nice, and I'm sure those days will still feel like the weekend when I return to work part-time in the autumn. How do you tend to spend the Indietracks festival weekend? It's usually incredibly busy, but a lot of fun! I'm often on the gates meeting artists, arranging press interviews or selling t-shirts in the merchandise tent! However, I also try and make sure I see my favourite bands as well, and hang out with my friends. The Sunday often feels a bit more relaxed, especially once we know all the bands have arrived. 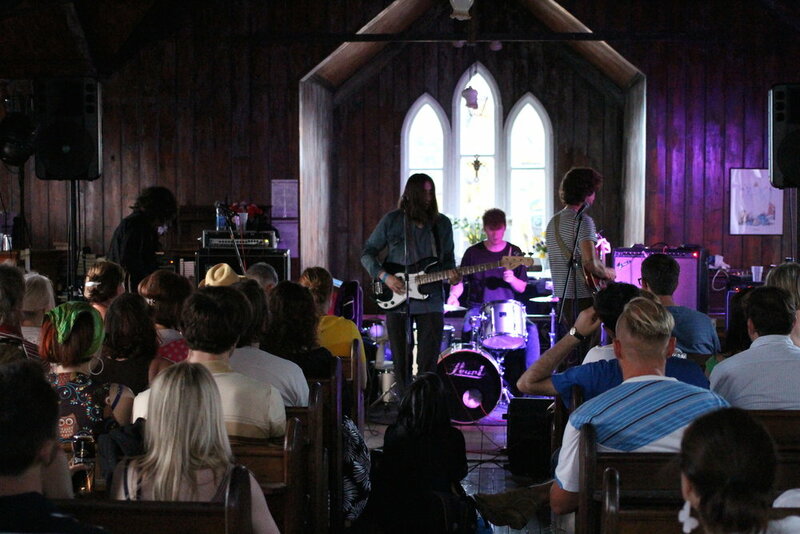 The venue is a beautiful steam railway in the countryside, but it's a bit off the beaten track and it's a relief when all the bands follow the directions carefully and find the entrance okay! This year will be very different as I'll be bringing Luke, so I'll be mainly spending the weekend in our new indoor children's area, helping to organise activities in there. Holidays are very different now that I have a baby, so my ideal break would be a nice cottage in a seaside town that's easy to get to, with some nice cafes, galleries, shops, a beach and ideally some music going on somewhere. I've always loved festivals, so somewhere to watch some bands in the daytime with a couple of drinks and some nice food, but with an easy walk back home afterwards! Breakfast: Ideally brought to me in bed by someone else! Do you have a signature dish you like to cook? Looking after a small baby means I don't have much time or energy to cook at the moment, but I do like quick and easy comfort food - so fish pie and apple crumble are probably two of my favourite things to make! What's the normal soundtrack to your weekend? At the moment it's BBC6 Music, the Indietracks 2017 Spotify playlist, the latest Wave Pictures album and baby lullabies. Museum: I don't really have one, but I went to the Museum of Brands recently and really enjoyed it! What can we expect from Indietracks 2017? We're a friendly festival that celebrates creative and independent pop music, and we're based at a steam railway in Derbyshire. So visitors can ride the steam trains, and watch bands playing across four different stages. We're so excited with this year's line-up, which has some internationally-known names like The Wedding Present, Cate Le Bon and Frankie Cosmos, alongside some of the most exciting new artists around, including Martha, Joanna Gruesome, The Tuts, Peaness and Shopping. We'll also have art and craft workshops, discos, real ale, fine foods, a family area for babies and toddlers and late night karaoke.